Climate change is not only the most demanding, but above all the most creative task that has ever faced mankind. SAVE THE WORLD is a theatrical format which since 2014 has literally ‘staged’ questions of global future and worldwide challenges such as climate ch- ange together with players from the world of art, science and politics. To enthuse a broad public with the desire and inspiration for complex themes – that’s SAVE THE WORLD. 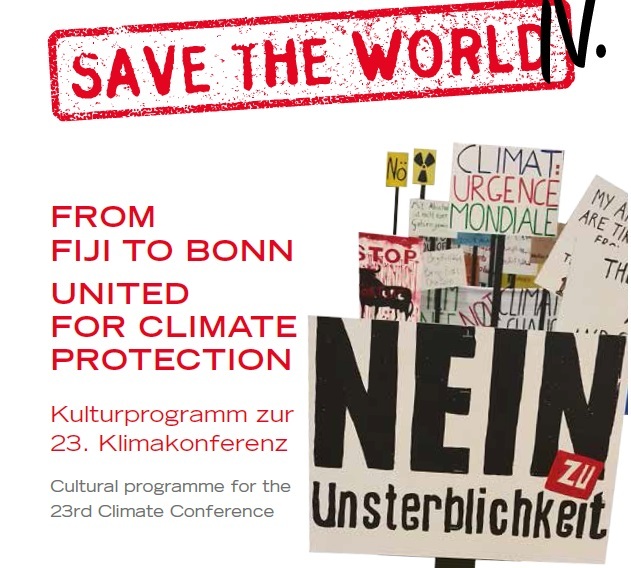 To mark the 23rd Climate Conference we are leaving the theatrical stage to occupy, together with artists, experts and activists, the geopolitical stage around the UN Campus. For the opening of the world climate conference, the musician Bernadette La Hengst, together with the Theater Bonn Children’s and Youth Choir, the Climate Ambassadors Bonn and the Beetho- ven Orchester, is sending a love letter to our planet. As the official contribution of the city of Bonn, the song I’M AN ISLAND will welcome climate protagonists from the worlds of politics and science. The video by Achim Lippoth accompanying the song will be available for watching on the net worldwide simultaneously with the opening ceremony. Appearing in Germany for the first time with an action, the American activist group Yes Men – subversive and smart as they are – will revolutionize climate policy. The Yes Men’s action art takes the form of utopian interventions and clever protests, with the aim of shaking people out of their slumber, mirroring our society and thus drawing attention to global shortcomings. With a great deal of wit and imagination, they have committed themselves to a better world, nonchalantly inventing a new culture of protest. And the British artists’ collective Stan’s Cafe will stage WHAT WHEN right in the middle of the Rheinaue: a forest of signs with a multitude of slogans from protest and environmental campaigns past and present. As experts in the visualization of socio-political associations, they show a unique kaleidoscope of the obstinate commitment of activist groups, think tanks, and NGOs to a better world. Stan’s Cafe became known internationally through their unusual rice show OF ALL THE PEOPLE IN ALL THE WORLD, premiered in Bonn in 2015 in the context of SAVE THE WORLD. Within the framework of YOUNG PLANET PuppetEmpire and David Fermer created an interactive stage play for children aged 8 and over. In the search for a second earth, science, technology and art meet at the edge of our solar system: breathtaking landscapes, distant worlds and in the middle of it all, a lost robot.